Wildlands Conservancy, together with the Lehigh Valley Center for Independent Living (LVCIL), has identified opportunities for increased accessibility at our Emmaus-based Pool Wildlife Sanctuary. The Floodplain Trail, which is sought-after for its boardwalk and beautiful view of the Little Lehigh Creek, is among the sanctuary’s features slated to be enhanced this year. Placing trailhead signs at the beginning of the trail that state length, surface, tread width, running slop and obstacles. Establishing a stable 60” x 60” turnaround spot at the intersection of the Floodplain Trail and Pheasant Run Trail, allowing persons in wheelchairs to turn around, rather than reverse the length of the trail. This effort to increase accessibility follows Wildlands 2013 creation of a .5-mile sensory trail. 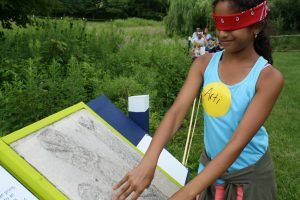 The unique trail provides inclusive outdoor recreation for people with low or no vision and acts as a valuable educational tool. Simulating low or now vision introduces children to experiencing nature from a different perspective. Visitors have come from as far as Virginia to experience the inclusive trail. Simulating low and no vision allows visitors to experience nature in a new way.